On the left legendary Niagara River guide Frank Campbell was kind enough to show the Fishing 411 crew river fishing “Niagara Style”. 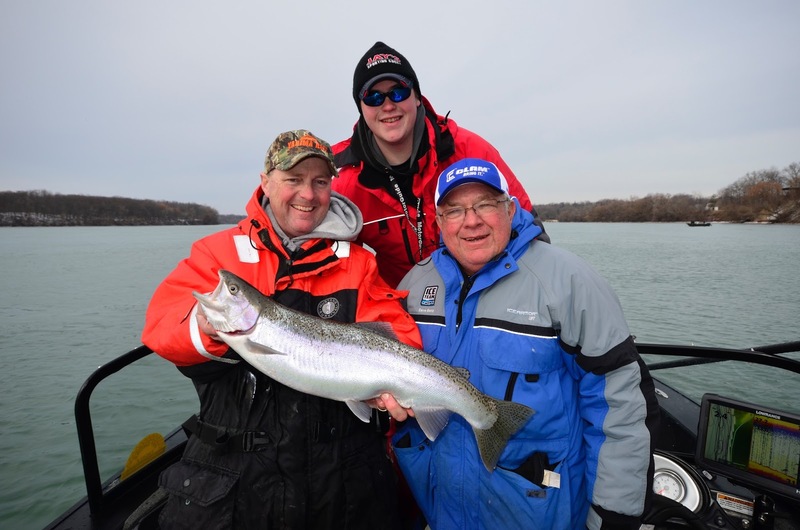 Our guest Dave Genz (on the right) America’s favorite ice fisherman spent a few hours in the boat catching his personal best brown trout and steelhead. Jake in the back fulfilled a dream of being able to fish with two of the best our industry has to offer. For those fishermen who can’t get enough trout action, the late fall and winter months are a special time. 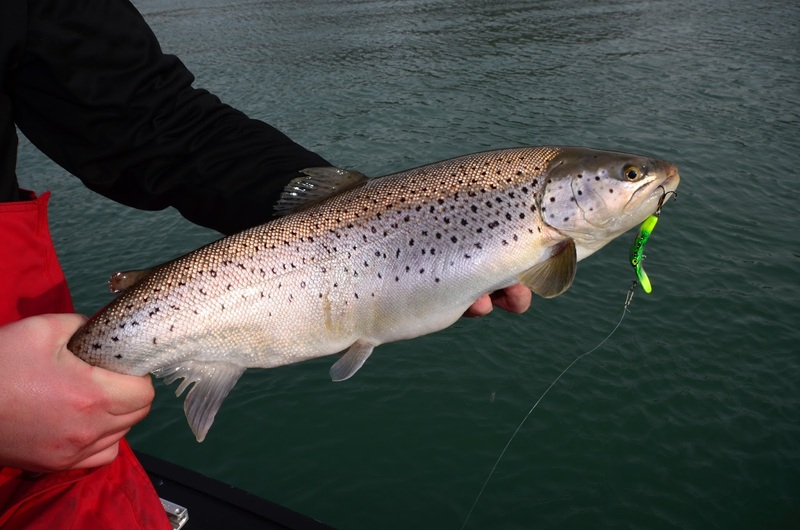 At the end of the year, cold water species including brown trout, lake trout and steelhead converge on flowing water. Some of these fish are heading to rivers to spawn and others are heading upstream to feed on the eggs of other fish. Either way the stage is set for some amazing fishing opportunities focused squarely on the major rivers of the Great Lakes basin. In the Great Lakes we are blessed to have countless river systems that produce great trout fishing. 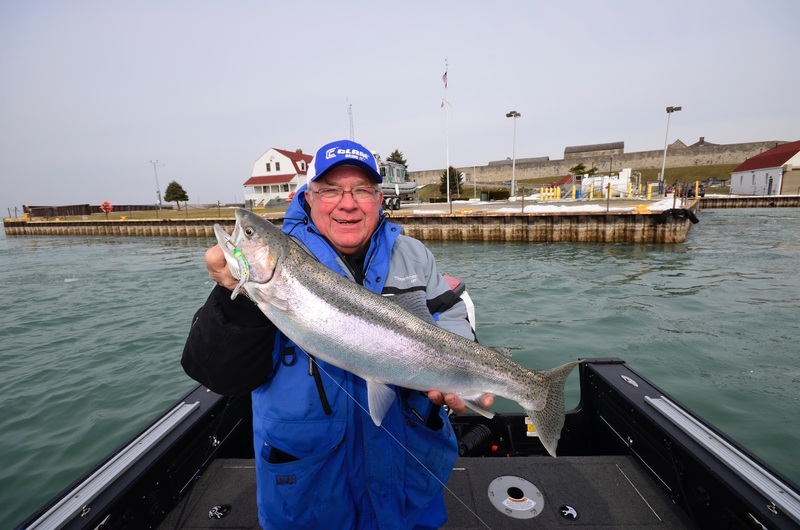 Just a few of the noteworthy rivers every angler should be thinking about fishing include the Salmon and Niagara Rivers in New York, the Conneaut River in Ohio, the Big Manistee, Muskegon, St. Joe and the AuSable rivers in Michigan. The above mentioned rivers are great destinations, but they represent just the tip of the iceberg. There are dozens of other streams that offer up equally noteworthy fishing action. The one thing that these rivers have in common is during late fall and well into the winter months one particular lure type tends to be lights out for steelhead, brown trout and also lakers. High action wobbling plugs do an amazing job of triggering strikes from all three of these fish. Sometimes classified as “banana plugs” most of the lures in this group have that classic curved shape of a banana. Legendary baits like the Yakima Flat Fish got the plug bite started decades ago. Since then many other noteworthy lures have hit the market including the Yakima Mag Lip, Luhr Jensen Kwik Fish, Heddon Tadpoly, and Lindy River Rocker. for ways to put more fish in the boat. It’s the wide “side to side” wobble of these plugs that sets them apart from other crankbait designs. A few of these plugs go a step further and generate an unique “wandering” action. The skip beat action of the Mag Lip is accentuated when fishing in flowing water. Variances in current flow allow the Mag Lip to enjoy a more pronounced wandering action and this is precisely why so many anglers are using Mag Lip. Available in 2.5, 3.0, 3.5, 4.0, 4.5 and 5.0 sizes, the Mag Lip family of crankbaits is ideally sized for a wealth of fishing applications. River anglers tend to favor the 3.0 and 3.5 sizes for steelhead and browns. The larger 4.0, 4.5 and 5.0 sizes are popular among lake trout fishermen. Banana plugs are fished in rivers a couple of different ways. In shallow water these baits are generally fished “drop back” style from an anchored boat or from a drift boat. When the boat is held steady in the current, these plugs dive and wobble their way towards bottom. In deeper rivers plugs can also be deadly, but they are generally fished on a three way swivel rig with 1 to 2 ounces of weight added to keep these lures in contact with the bottom. When fishing three way rigs anglers can drift fish or use an electric motor to slowly troll downstream. For upstream trolling chores a small gasoline kicker motor is required. One of the reasons plugs work so well in rivers is because flowing water tends to carry sediment creating off color water. Plugs fish best in the stained water conditions so commonly found in rivers across the Great Lakes basin. Wobbling banana style plugs are hands down the choice of serious river guides all across the Great Lakes region. Most of these guides like to “customize” their plugs by replacing factory hooks with premium after market hardware. Others add a touch of color on the lip or flanks of the bait using a permanent marker. visit to the Niagara River in the winter time. fishing with the Fishing 411 crew and river guide Frank Campbell. Another common way to get a few more bites from plugs is to fish these lures in combination with scent products. A plug doused with fishing scent, puts a fish attracting scent stream in the water. Gel style scents like Pro Cure are wildly popular among trout fishermen because these scent products stick to the bait and don’t wash off immediately like other scent products. Pro Cure scents are made using a host of natural forage species including smelt, gizzard shad, alewives, ciscoes, crayfish and many other bait fish. In the winter months when many anglers are zeroing in on ice fishing opportunities, there are lots of river fisheries that remain open and viable all winter long. Our advice is to dress warm and carry a tackle box full of wobbling plugs.